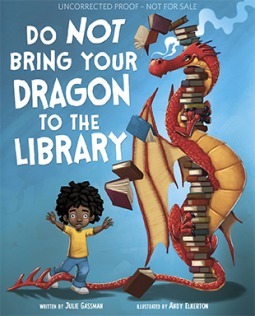 Do Not Bring Your Dragon to the Library, written by Julie Gassman and illustrated by Andy Elkerton, will be released to the masses on August 1st, and I predict that librarians who work with little ones will be eager to add this to their collections. It’s an excellent book to follow-up those beginning-of-school-year talks about book care and library behavior. Featuring a diverse cast of characters–both human and dragon–this book shows what might happen if dragons were allowed to roam free in a library. In short, it would be a disaster! But the friendly librarian has a solution for kids who want to share books with their dragon friends. Check out some fun reads, take them home, and enjoy them together. A win-win for everyone! While my young students may not have dragons at home (that I’m aware of), they may be able to use this book as inspiration to share their favorite stories–or other things they learn in the library–with pets, siblings, parents, and other people they encounter. Sharing a love of reading and libraries is what’s important!